And Dan said, "I can get us a DUNK TANK!" The year was 2014, and Dan Godwaldt, our maintenance manager, was commenting on a report of rides and entertainment I was making to the Annual Fun Fair Committee during a planning meeting. The stage was set for the Dunk Tank to be a main attraction and yes, I was one of the scheduled Dunkees, as well as Adrian Stelpstra our program director, and Klass Slagter, the Board President. Since being one of the coordinators of the fair, I thought I had the advantage since I set the schedule and was pretty proud of myself. Every person that agreed to be dunked would only be in the tank for 20 minutes. How hard would that be! As the time of the Annual Fair was getting closer, I started thinking of ways to raise funds for the camp through the Dunk Tank and came up with the idea of Pledges per Dunk. So three of the seven or eight participants this first year were up for the challenge and raised funds for each time dunk they were dunked in the 20 minutes they were in the tank. Raising pledges came easy for me at first. I put the word out on social media and then asked people I met at the camp during the setup week of the fair if they would sponsor me at a dollar amount per dunk. For those that I learned were not able to attend the fair it was easy for them to say sure and sponsor me $5-$10 per dunk. By the time I climbed into the Dunk Tank on Saturday at noon on September 20th, 2014 I had raised over $100 per dunk. Fortunately, for later September, it was a sunny day and the temperature was around 22°C. I figured I would be dunked maybe 10 times in 20 minutes, but God had a different plan. 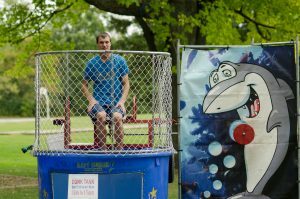 The Dunk Tank started well with a number of summer staff members starting out around 11am. I knew Adrian was just before me at around 11:40am. I was enjoying promoting the Dunk Tank from to Gazebo as the MC for the event and as my time got closer the excitement was building. The first ball hit the target and down I went, the water was so cold having just been topped up from the well to the useable level. I quickly came up out of the water chanting out to the thrower. Joel kept me moving up the ladder to the seat as quickly as possible. During the middle stretch of about 12 dunks or more, I lost count due to brain cells freezing a fter 10 dunks, Adrian came up to throw and I knew I was in for a series of dunks. I remember teasing him but that didn’t help. Time after time he hit the target as if the ball was tethered to the target. People were paying the tickets and letting him continue to throw. I am not entirely sure but I think Adrian dunked me around 15 more times. I remember hearing Joel announce that there was only time for one more contestant; I saw a little boy come up and felt relieved. Maybe I would get to catch my breath for a moment. My body was so cold and my mind was in a fog. Not to be, that little guy hit three out of three and finished me off at 30 dunks. I remember climbing out of the tank, after only 20 minutes, and feeling like I was frozen. The excitement was still flowing in the crowd as they learned that $3,000 had been raised. It took 45 minutes for me to get warm again and it was worth it. 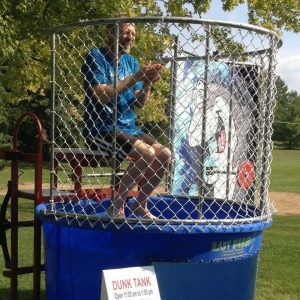 Klaas Slagter was in the Dunk Tank after me and was dunked around 10 times, raising more funds for God’s ministry at camp. In total after a few additional online gifts that were received after the fair; Adrian had raised $1,000, Klaas had raised $500, and I had raised $4,200. In 2015, I again raised pledges per dunk for the fair. This time I limited the number of time I would be dunked to 10. It took all 20 minutes for me to be dunked 10 times last year and $3,200 was raised for God’s ministry here at camp. The year on September 17, 2016, I am again going in the Dunk Tank for up to 10 dunks and hope you would consider sponsoring me per dunk. I have created a Dunk the Director page through CanadaHelps and look forward to announcing that $500 per dunk has been raised. If you are coming to the annual Fun Fair in Cambridge, I look forward to seeing you encourage me in reaching my goal. If you are unable to attend the fair, what better way to support a fun way to raise funds for God’s ministry here at camp? Click here to donate.